When you are open, the messages are so loud and clear. then begin to discover the miracles of synchronicity. 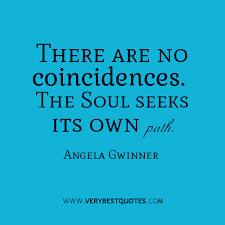 They come as random, meaningful, cosmic coincidences. Synchronicity is an event that is profoundly meaningful. around us as a synchronistic event. It is not magic, but the meeting of our inner world and our outer work mirroring one another. The Universe is more complex than it appears to us. Synchronicities are messages from our spirit guides and guardian angels. us loving direction, messages and guidance. This is their way of connecting with you and with your soul. If you listen, your soul will begin to speak to you. beautiful, unconditional loving souls that we are born with.